It is a known fact that Tiger Shroff is a fitness enthusiast. The actor likes to follow his much disciplined lifestyle and likes to call it a day quite early in the evening. The star kid also has rarely made his presence felt at a late night party. 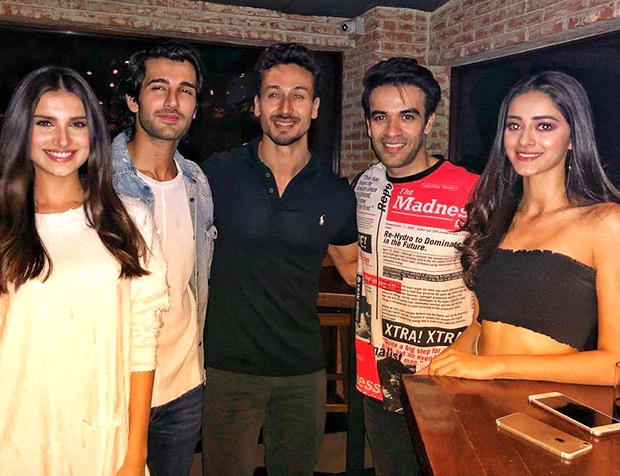 But he managed to tweak his lifestyle rules a little for his special Student Of The Year 2 team which also consists of director Punit Malhotra, newbies Ananya Panday and Tara Sutaria. Readers may be aware that Karan Johar who was keen on taking the franchise of Student Of The Year franchise ahead, roped in Tiger Shroff to take it forward with a sequel. The film was being shot in many locations including Dehradun where they recreated the St. Teresa School which was also a part of the first instalment. Now that all their hard work and shoot of the film has wrapped up, the team planned to celebrate the special day. The post wrap up bash of Student Of The Year 2 was held recently with the cast, the filmmaker being present. Considering that it was held late in the evening, Tiger Shroff would have otherwise skipped the party. But still, the actor decided to make changes in his usual schedule. We hear that Tiger took some time out from his usual schedule and decided to spend it with the film’s team. In fact, the team was thrilled to have him and they even shared about it on social media. Director Punit Malhotra took to Instagram to share the picture and captioned the same saying, “One of those rare occasions that @tigerjackieshroff steps out in the night?? .. only cos it’s a schedule wrap.” Well, we are equally surprised too! Coming to Student Of The Year 2, the film is expected to feature different characters set against the backdrop of the same school in a different year. After the retirement of Dean Yoginder Vashisht aka Rishi Kapoor, now the dean will be replaced by actor Sameer Soni. The film, which was expected to release this year, now has another release date. Also featuring Aditya Seal as the fourth student in the film along with Tiger, Ananya and Tara, the film is slated to release on May 10, 2019. Don’t worry, be happy. You’ll be healthier and live longer.